This is a lovely wine. Lopez de Heredia is an ultratradtional winery in Rioja, with no concessions made to modernity. I really like their wines, which show lovely complexity, made in quite an oxidative style. 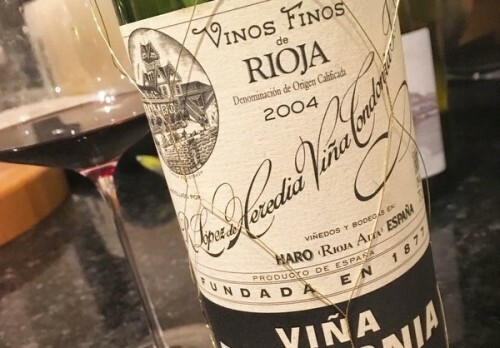 This Reserva 2004 is still a baby, but shows brilliant potential. If you can find any of the whites, they are also superb, and I’ve heard that the rosé is also amazing, but I haven’t tried it yet. I bought a couple of bottles of the Vina Tondonia Reserva 2004 last year in Spain when I found them discounted to €11. Not tried them yet and I´m wondering whether I should keep one back, not sure for how long though and the fact that i store my wines at the bottom of a pantry in our extension which is dark and has a pretty cool steady temp, although not ideal it seems to do the job. I´m a regular visitor to your site and have had many good affordable recommendations from you, keep up the good work. Another fine wine that is more about technique and time than terroir, I’d suggest.